Isn’t this also what the church does to babies? Churches baptize babies into their religion without first checking to see if the baby believes in the tenants of the church. Rather than waiting until a person has reach the age of consent, they forcibly baptize the kid in hopes that it sticks. They attempt to predetermine a human being’s entire belief system for the rest of their life before that human being even has the ability to speak or walk. It’s also the first step of indoctrination: a system by which religion attempts to base membership and belief on the family tree and genetics rather than via self-determination. That’s also a little weird. Right? You wouldn’t administer last rights to an unconscious, dying man if you didn’t know he was Catholic, but you force your non-communicative, illiterate child to become a member of God's covenant without any consent at all. The Amish, for example, have rumspringa, which normally begins somewhere between the ages of 14-21 and ends when a youth either chooses baptism within the Amish church or instead leaves the community. During rumspringa, the usual behavioral restrictions of the Amish culture are relaxed so that Amish youth can acquire some experience and knowledge of the non-Amish world. In other words, they are given options, provided with information, and encouraged to make a choice. Only then are they baptized. About 85-90% of Amish choose to be baptized, but some do not. They leave the community to live their true, authentic lives. Some Christian religions also believe that baptism confers faith as a gift from God, which I also think is kind of weird. God’s first gift to a baby is the belief in himself as God the Almighty? A little self serving. Right? Again, it’s not a big deal. I was baptized as a baby, yet I sit here today as a reluctant atheist. A nonbeliever who wishes he believed. I probably sent that gift of faith back when I was an infant for a rattle or a teething ring. When Elysha and I were engaged, I was already an ordained minister, so I kept threatening to marry us before the big day. I told Elysha that when she was asleep, I would whisper, “Do you, Elysha, take Matt as your awesomely married husband?” Then I would tap her shoulder and whisper, “Say yes, honey,” and in her sleepy state, she probably would. Bingo. We would be married. Except we wouldn’t, of course. I’m not sure if a minister can actually marry himself, but more importantly, marriage vows require consent because they represent a covenant between two people. An important and hopefully everlasting bond. You can’t be forced or coerced into marrying another human. Not in Western culture, at least. You can be coerced into not marrying another human being (horrible, self-serving jerk-face parents who insist that their children marry within the religion or the culture do this all the time), but even that non-marriage ultimately requires consent. Something as important and profound and life-altering as religion should probably require similar consent. Right? Again, all of this baptism stuff is not terribly important to me, and it’s hardly something to complain about. It’s not as if babies remember their baptisms, so the sway that a baptism holds in a child’s decision to leave the church or remain is exceptionally small. But the sign is still weird for me. 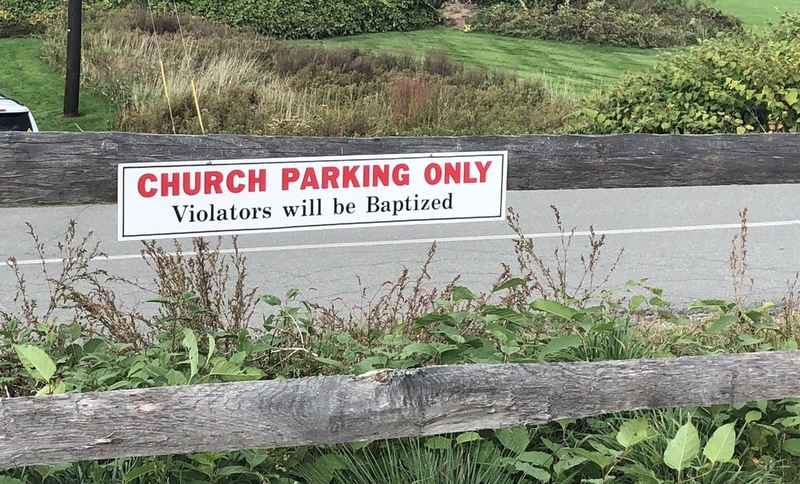 It highlights the forcible, non-consenting nature of baptism, which might not be what the church should highlight when attempting to keep heathens (and potential converts) like me from parking in their lot. Again, it’s not a sign to be taken seriously. but it’s perhaps not the message church wants to send about the nature of baptism, either.